The top job for the top 1 percent of income earners was physicians, followed by managers, chief executives, and lawyers. These are people making over $207,000 a year. 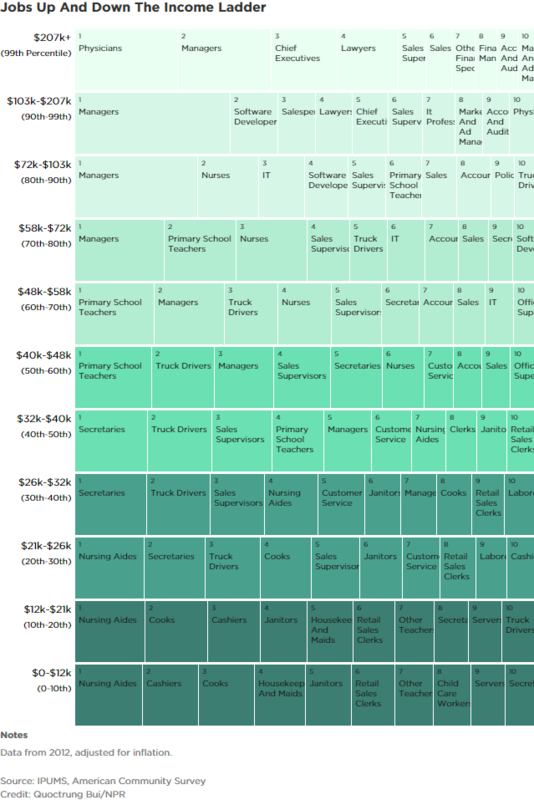 The upper-middle income groups with incomes of $40,000 to $103,000 is sprinkled with managers, accountants, teachers, truck drivers, and nurses. Truck drivers ($12,000 to $103,000), sales supervisors ($21,000 to above $207,000), and secretaries ($0 to $72,000) fall into wide ranges of income categories. I’ve posted a static version of their graphic below, but see the original post to play with the interactive version.